Cove Manila seemed to have shot itself in the foot. 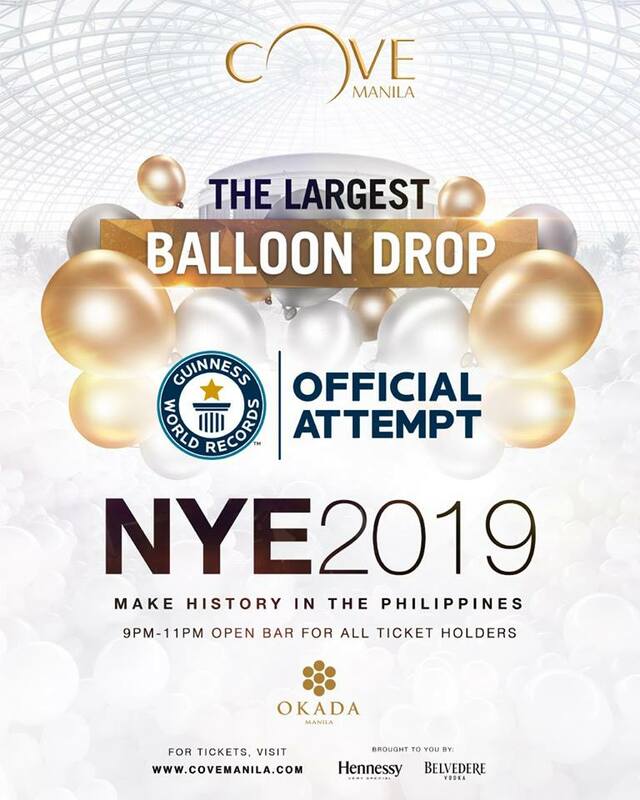 The largest indoor beach and nightclub owned by Okada Manila is now under fire for its plan to have the largest balloon drop—with 130,000 balloons to be exact—on the New Year’s Eve. This is an attempt to have its “feat” immortalized in Guinness World Records, a 63-year-old international “world record” authority documenting all kinds of superlatives, including dumb ones (like the most tennis balls caught with a bucket on one’s head and hardest kick to the groin). Well, people on the internet were quick to point out the negative environmental impact of the program on Facebook. Balloons have become a fixture at celebrations all over the world. They’re cheap, colorful, and easy to play with, especially for the kids. However, they pose a big threat to the environment as these non-biodegradable latex end up on land or in the ocean, homes of wildlife, and will remain there until they degrade over time, over centuries. In fact, mass balloon releases are now illegal in various states in the US and countries UK and Australia. Now, after receiving backlash, Cove Manila emphasized that the balloon drop will be held indoors and that the management will follow proper waste disposal. “It is an earnest effort not only to make a new world record for the country but also to demonstrate that we can have a lot of fun but still remain responsible,” they write in a statement published on Facebook Dec. 29. They claimed that the balloons are biodegradable, the event was planned with solid environmental management protocols, and that the balloons will be recycled. It’s really set to happen. But what do these words exactly mean? We need to be wary of these so-called biodegradable balloons (and plastics) because most often than not, they are fake. Some claims are just influenced by commercial interests. If the balloons were made with a hundred percent natural latex, then they’re biodegradable, but that would be costly. Usually, manufacturers add plasticizers, and artificial dyes making them not exactly “biodegradable.” It would take them years to degrade and in between, could contribute to the already growing plastic waste, could be ingested by wildlife, and could block sewage. The Department of Environment and Natural Resources (DENR) has intervened on Dec. 29 and ordered the event organizers to drop the balloon drop. The department is ready to arrest and file charges against the organizers who will push through with the event, says Environment Undersecretary Benny Antiporda in a phone call with Inquirer.net. On Dec. 30, Cove Manila announced that they’re canceling the balloon drop event. “The management of Okada Manila has voluntarily decided to cancel the Balloon Drop event as a sign of respect to the DENR’s recommendation and in support of the Government’s campaign to protect and save the environment,” the management posts on Facebook. Nobody asked for or want this world record. May this issue perpetually remind us that we don’t need balloon releases during celebrations no matter how moderate or extravagant they may be and that as much as we can, refuse the single-use plastic. Get more stories by subscribing to our newsletter here.